Can I tell you a secret? I'm scared to death of the month of March. I actually DO beware the Ides of March. You see, over the last decade or so...about every other year around the Ides of March I have had a car 'incident' of some kind. Accidents. I hate them. Last year it was a little late...it happened on April 1st instead and was one of the worst ones yet. Oh, yeah...like THAT is much better! HA! Thus, I am always quite aware of the Ides and their arrival. I can almost hear the soothsayer who warned Julius Ceasar offering the same to me. So, I'm not a big fan of March, but I do love the coming of Spring, so I just focus on that part! AND...with that, I have a couple of things to share with you today! Retro Cafe Art is sponsoring over at Gingersnaps Creations this month and this week's challenge is to use BORDER PUNCHES!!! 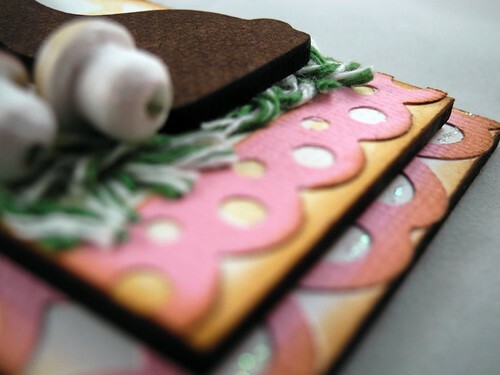 I layered several strips of a wide border punched strip across the Masonite ATC Base and then covered the Arch with patterned paper and added that to the base along with another border punched border, some twine to serve as grass, and then the Chocolate Bunny cut out! The adorable little German Cotton Spun Mushrooms were the PERFECT accent to finish it off! You should check out the challenge! The prize is AWESOME!!!! ACK!!!! It's an attack of Critter Cuteness!!!!! HAHAHAHA!!!! I crack myself up. I really really do. Just say'n. ANYWAY....it's a super fun itinerary and you totally should participate because all the cool kids are doing it. For reals. HA! That, and what in the WORLD would posses you to skip out on something that could potentially lead to the co-mingling of gnomes, puppies, and monkeys with mustaches? I mean, REALLY, here people. Just say'n. 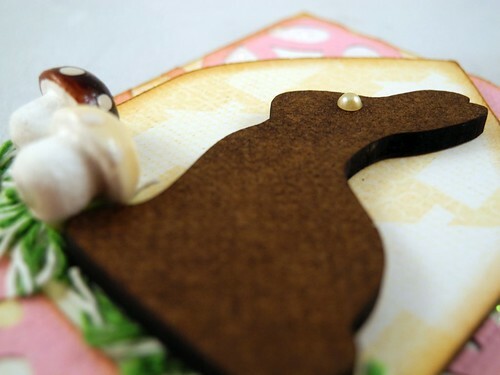 oh i love that chocolate bunny --way to cute!! What stamp set has those little mustaches? Just too cute. 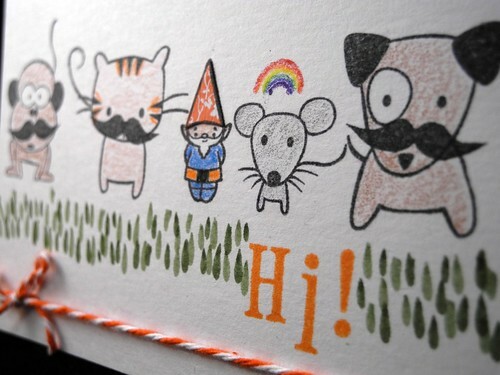 I know I should be focusing on the bunny or the way you used the border punches on your card (and those are awesome!) but I can't take my eyes off the little mushrooms!!! I had a thing for mushrooms as a teen (way back in the dark ages) and collected mushroom pictures, especially ones that had a more fairy or fantasy element. Oh these little mushrooms have that same air about them...cuteness deluxe. I can just imagine a tiny frog or mouse making a home out of these little lovelies! So sorry for your fear of the Ides of March...while I can't put an exact month to my fender benders, I can relate with hating car accidents!!! Great cards! I especially love your little critters! both of these are just so darn cute...I am diggin that fun rabbit and cool little critters...great cards..
Love the cards both of them~hoping for a great March~starting a new trend~no accidents!! That bunny card is adorable!!! Great cards as always...but i love the bunny one the best! That brown felt bunny is really cute. I want to eat the bunny . . .
hoping this march is MUCH better for you! LOVE your chocolate bunny! Makes me want to go buy one and eat it! :) Congrats on the guest DT gig!! I love your adorable cards! That bunny looks good enough to eat. I really hope you didn't have an accident today!! So cute! Love that chocolate bunny! WOWZERS!!! 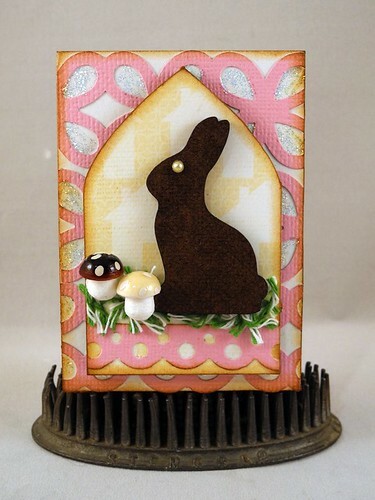 Love both your CAS card- but the bunny and borders- and mushrooms : ) that is just fabulous!!! Both of your card are so cute. I am really liking the chocolate bunny one....not only because it looks like chocolate, but those mushrooms are so cute. He knows what's comin' . . . Awesome creations! 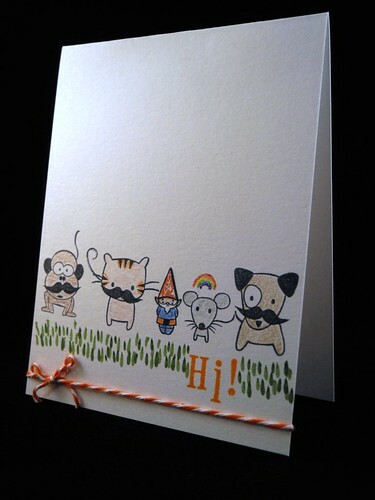 I do love those tiny mushrooms in your ATC and those moustachioed pets just cracked me up! Love the chocolate bunny and hoping your safe all through March and the rest of the year. cute cute cute as can be!!! loveee how you used twin for your easter grass!